The Concept Rail patented design separates vehicle loads from track loads with a unique patented sub-structure. The heavy duty design has been engineered using Finite Element Analysis (FEA). The track is rated for 45t train axle loads. The crossing has been rated for 789D mining trucks and Quad combination trucks at maximum operating speed. The level crossing can be adjusted to suit the rail height of the track after maintenance tamping. The level crossing can be relocated and reused as required. The track design is that of an ‘undisturbed through type’ retaining the same harmonic track modulus. No transitions required. This system has an internal drainage gutter able to divert water to the external civil drainage. 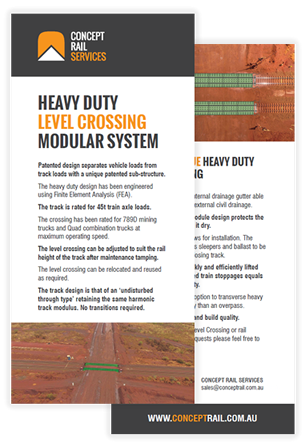 The level crossing module design protects the formation and keeps it dry. Reduced track windows for installation. The modular design allows sleepers and ballast to be preinstalled prior to closing track. Modules can be quickly and efficiently lifted into position. Reduced train stoppages equals increased productivity. Cheaper and simpler option to transverse heavy traffic over the railway than an overpass. Robust engineering and build quality.